Some of the most anticipated summer events in Vancouver are our festive, open-air, longtable style dinner parties. At this particular event, you can give back while indulging. 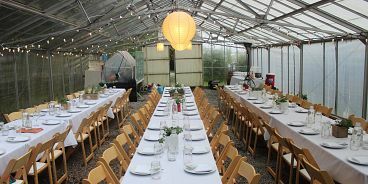 Urban Zucchini is hosting an outdoor feast at UBC Farm that will support initiatives to connect Vancouverites to local, sustainable, delicious food that’s grown right here under our noses. Celebrate the Solstice happens, fittingly, on June 21st at UBC farm, a 60 acre field that will no doubt be enchanting at sunset. Before dinner, guests will be taken on a tour of the property, Vancouver’s largest working urban farm. The meal will feature bounty from these rich soils prepared on site by Forage Chef Chris Whittaker (if you haven’t visited his lower Robson street restaurant you must — it’s one of the best in the area).